Don’t miss the Cinco de Mayo Flash Sale at Secrets Resorts & Spas! Happy Cinco de Mayo! If you’re in the mood for a Mexican Fiesta, then you’d better act fast. Our exclusive Cinco de Mayo Flash Sale will only be here for a limited time and the savings are INCREDIBLE! If you’ve been dreaming of a tropical vacation for some fun in the sun then now’s the time to act. We’re offering you the chance to reserve your Unlimited-Luxury® vacation to select Secrets Resorts & Spas locations with rates starting at $99 per person per night! Don’t miss out on incredible savings during our Cinco De Mayo Flash Sale at Secrets Resorts & Spas! Warm Up Your Winter at Secrets Resorts & Spas! Dreaming of warm sand beaches and cool tropical drinks? For a limited time only, book your winter getaway to Secrets Resorts & Spas in the Riviera Maya and receive our Winter GREATaways pricing PLUS an added value of your choice! Wash away your winter blues at select Secrets Resorts & Spas with our Winter GREATaways added value promotion! We all know that all our Secrets Resorts & Spas offer stunning settings for couples to enjoy their time together while also taking advantage of amazing Unlimited-Luxury® privileges. Secrets Aura Cozumel is, of course, no exception! Follow Kristin and Shadi, AKA the Vacation Couple, during their recent stay at Secrets Aura. Makes you want to grab your guy or girl for a romantic Cozumel getaway, too, doesn’t it? We thought so. Enjoy the video! Go ahead, book your stay at Secrets Aura Cozumel today — we know you want to! Click Here. Share your Secrets Aura Sunsets! How would you like to spend a few days kicking back and taking in the incredible tropical view at Secrets Aura Cozumel? If you’ve ever visited Secrets Aura, you’ve experienced the incredible sunsets of this island paradise. Now is your chance to share your best sunset photos for the opportunity to win a 3-night return stay to Secrets Aura Cozumel! Entering is easy. Take a picture of the beautiful sunset from Secrets Aura Cozumel or choose one from your recent stay! Submit your photo, caption and contact information here on Facebook or with Instagram or Twitter using the hastag #SecretsAuraSunset. Share your submission with friends to receive votes and win a return 3-night stay at Secrets Aura Cozumel! We can’t wait to see all the fabulous sunset photos our guests have filed away. Good luck and we hope to see you soon at Secrets Aura Cozumel! Free Fall is back! Free nights & free coupons! The Free Fall promotion is back and has great offers just for you! When you reserve your minimum three-night vacation to any Secrets Resort & Spa, you will enjoy every third night of your stay for free! Plus, you will be treated to up to $400 in resort coupons to use on things such as spa treatments, romantic dinners, bottles of wine and more! For more information, head over to the Special Offers page on the Secrets website. 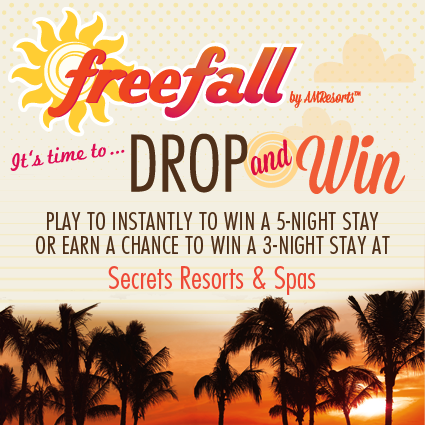 Plus, play our Drop & Win game on any Secrets Facebook page where you will be entered to win a three-night stay or you may possibly be the lucky, instant winner of a five-night stay! Valentine’s Day is only one week away! Are you and your special someone coming to Secrets Aura Cozumel for a romantic getaway? We have plenty of romantic activities planned for you and your sweetie on this very special day. Before you set off into the sunset on your private dinner, plan a couples massage at our world class Secrets Spa by Pevonia. We will offer guests a special promotional package that will set the tone for your special evening. 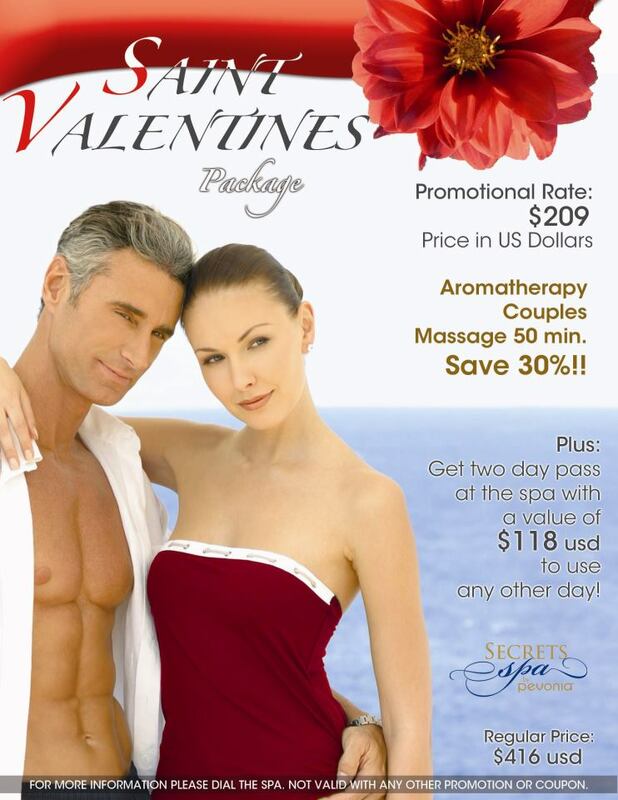 To book your Valentine’s Day spa treatment today, contact your concierge! The First Secrets in Cozumel! We are beyond excited to announce that on December 15, 2012 the first ever Secrets will be opening in Cozumel! Secrets Aura Cozumel will be the first Unlimited-Luxury® resort in Cozumel, a small island just off the coast of Cancun. In addition to unlimited access to gourmet restaurants, endless top-shelf spirits, exciting live entertainment and daily activities, guests will also be able to take part in amazing diving excursions! Guests who are certified divers will be able to explore the natural wonders of the underwater world starting at just $60! This amazing experience comes completes with a two tank boat dive, a dive master weights and belt! 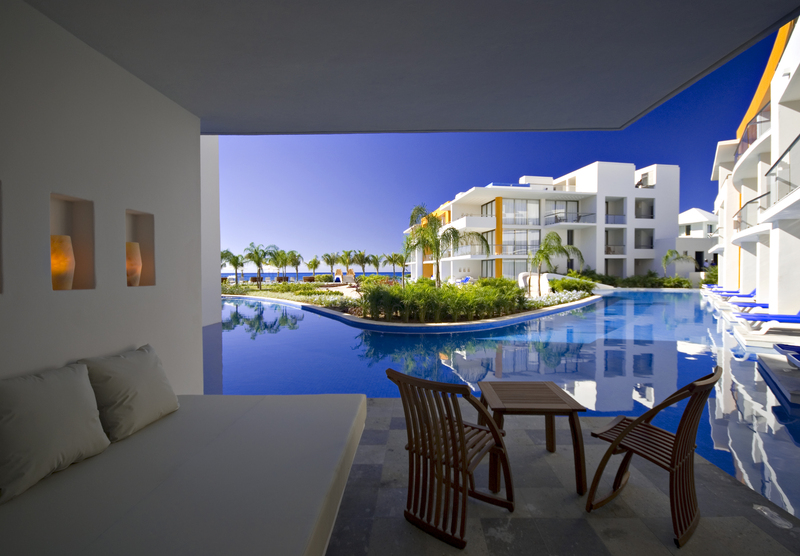 Secrets Aura Cozumel is an all-suite resort that is a perfect mixture of luxury and excitement. The only all-adults resort on Cozumel, Secrets Aura is sure to be an ultra-luxurious, exciting getaway for couples, friends and singles looking for a supreme getaway in paradise, do it all or do nothing at all at Secrets Aura Cozumel. And because we want you to love Secrets Aura as much as we do, we want you to enjoy an exclusive introductory offer! When you stay at Secrets Aura Cozumel from December 15, 2012 through December 23, 2013 you can enjoy exclusive rates starting at just $120 per person per night. Hurry and reserve your getaway soon, this offer won’t last long!